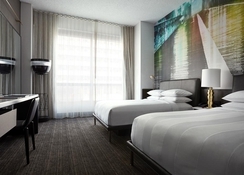 Experience absolute sophistication complemented by the balminess of American hospitality at the Marriott New York at the Brooklyn Bridge. Pick from a well-appointed selection of rooms, spa, gastronomic venues, refreshment and fitness amenities as well as conference and event spaces. 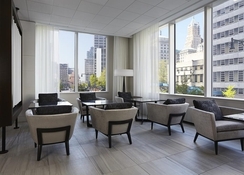 The hotel is just a short drive away from numerous shopping, dining and entertainment avenues. In addition, you can easily access many nearby attractions including the Brooklyn Museum, Old Stone House, Plymouth Church of the Pilgrims. 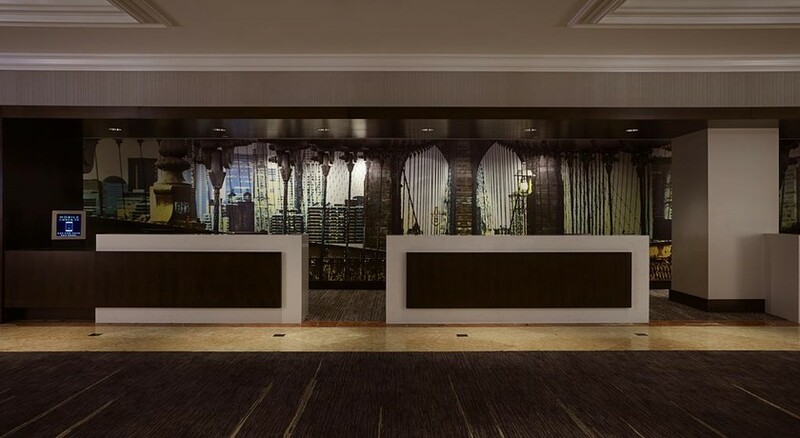 Marriott New York at the Brooklyn Bridge has multi-lingual group of experts, who will ensure that all the requests made by the guests are given utmost commitment and emphasis. The hotel also offers plentiful sport and leisure facilities that will keep guests engaged throughout the day. Marriott New York at the Brooklyn Bridge is located on Adams Street, New York. 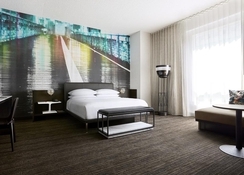 The hotel’s location makes it possible for the guests to pay a visit to a number of attractions that are just a few minutes’ walk or a short drive away, including the Brooklyn Bridge, Brooklyn Bridge Park, Brooklyn Botanic Garden, Prospect Park, Coney Island and Manhattan Bridge. The LaGuardia Airport is the nearest airport at 16km. 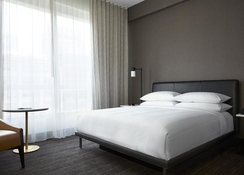 All guestrooms have the necessary amenities, including flat screen TV, telephone, double bed, air conditioner, sofa, chair, safe, table with seating for six, desk, writing work, electrical outlet, iron and ironing board. From Italian to Arabic, Mexican and much more, you can enjoy optimum international cuisines and pioneering dishes catered with unrivalled hospitality and service. There are many venues in the hotel, where you can enjoy sizzling flavours and culinary traditions. Take a look at the bars and restaurants within the hotel: The Great Room Bar & Lounge (American), Brooklyn Pantry (Sandwiches), Rocco's Tacos & Tequila Bar (Mexican), Potbelly Sandwich Shop (Sandwiches), Hill Country Chicken (American), Hill Country Barbecue Market (Bar-B-Q), Panera Bread (American), Shake Shack (American), Queen Marie Italian Restaurant (Italian), River Café (American), Junior's (Deli), Tripoli Restaurant (Middle Eastern), Heights Café (American), Grimaldi's Pizzeria (Pizza), Jacques Torres Chocolate, Café Buon Gusto (Italian), Water Street Restaurant (American) and Bubby's (American). 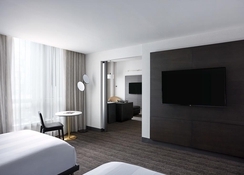 Considering the preference of today’s travellers, Marriott New York at the Brooklyn Bridge offers a wide range of sports and leisure facilities. Guests can energise themselves at the fitness centre that comprises latest exercise equipment’s. What’s more relaxing and pleasuring than a personalised spa experience provided by the experts in the hotel. 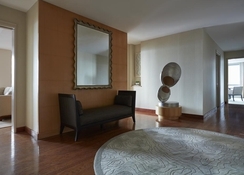 The spa in the hotel will pamper you and lead you to the journey of ultimate rejuvenation.